Ted Burke LIKE IT OR NOT: BLUES HARMONICA GENIUS!! Sugar Blue Blows Them Away!!@! Sugar is definitely my "Man" I'm a bassplayer by trade, but have been foolin around on Harp most of my 54 yr. life. Like you, hearing Sugar for the first time on Blue Blazes, caused me to let 'em lie for a week or two, but then, I went through the same thing on Bass after seeing Stanley Clark for the first time. There's a lot of guys whose playing I appreciate for different reasons, but Sugars precision, and ability to evoke tones with breath and mouthing techniques, without relying on mic/amp effects, is, to me, what sets him apart. Interesting article. Although I have not purchased Sugar Blue's latest album I am very fond of his previous records. He pushes the envelope of what a blues harmonica player should be. 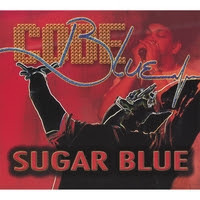 I am curious as to why you say that Sugar Blue comes along late in the day? A seasoned player such as you should realize that Blue's career stretches back at least 3 decades and he is hardly proving himself now. I also find it that a player of 40 years would have the audacity to say that John Popper is a man who has "sullied" the legitimacy of speed harp. Just because of the mechanics of the diatonic harmonica there is no possible way he could be hitting wrong notes frequently. I press you to provide examples. As for Sugar Blue's solos, they are exciting for about the first three or four songs. After that he has pretty much spent all of his tricks and is only ever doing variations on the patterns that he repeats over and over again. His fast runs and rants are all the same the only thing that changes are the chords behind them. His harp work is not the best that one can come across anymore. See Popper, Ricci, Del Junco, Levy. We disagree, obviously, on the matter of John Popper. I'm willing to concede that he has a unique sound, but it's a not a pleasant sound at all. His speed is impressive, but his intonation leaves much to be desired. He needs more Butterfield clarity in his playing, less Bob Dylan, which is to say that those slurs, chokes and bends should be more musical. You think Sugar Blues uses up his licks after three or four songs and I think otherwise. Any and all blues and rock players have a limited vocabulary as to what they can do given the splendid simplicity of the forms, and their art, as soloists, is to develop a style and hone a technique that allows them to get the most bang for their blues buck, ie, play with a minimum of repetition. Popper has patterns no less than Blue, (or Norton Buffalo, or Mark Ford, or Ricci or any other worthwhile harp players), and the issue is how well a player parlays that into a style one can adjust, vary, and continually keep interesting in the course of a live set or a disc. Improvisation is basically "variations" on these patterns, and how well one controls their technique as it serves their imagination is the real criteria, not their speed. Blue continually surprises me , live and on record, and I admire his command of tone, phrasing and continuity. Popper is speed for speed's sake, and it's really not worth the effort it takes to listen to him wheeze and gargle on the harp, hitting all manner of clams and bum notes, just to witness one of his sklar runs. Ricci, Del Junco are very, very fine harp players, and absolutely no one is better than Howard Levy, who's virtuosity is off the chart. Levy, though, is a thoroughly trained musician, a pianist first, a harmonica player second, and a jazz musican at heart. What he plays, what he can do, and the musical resources he draws upon are quite a few steps ahead of what all the other mentioned players are capable of doing. Sugar Blue, though, is very much in the upper echelons of other blues and rock harpists; he's the first real advance in blues harp style since the debut of Paul Butterfield. A broad claim,I suppose, but one I'll stand by. All the same, thanks for reading, thanks for the comment, and rock on, brother!